I live in Tucson and have been here for 2 years. Originally from Chicago where I had lived my whole life. I live with my 2 adult children, my awesome grandson, 4 dogs (all rescues from shelters), a red foot tortoise and the newest addition to the bunch is a cockatiel. I had dabbled a little with embroidery while I was growing up but it didn’t really stick at that time. In 1995, I was going through some personal stuff and needed something to occupy my mind and time so I went into a local craft store and walked up and down the aisles. The second to the last aisle was counted cross stitch. I sat on the bottom shelf and started browsing thru a leaflet they had there and found a simple design to stitch. I gathered up all the supplies needed, went home, stitched it and an obsession was born! I had to go look (LOL) I made my first post in January of 2010 but didn’t really start updating regularly until 2011. My blog title is a play on my name. I started blogging mainly to see my own stitching progress. I had been reading other blogs and liked comparing the ongoing progress on the pieces they displayed. 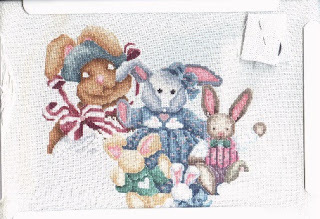 Oh goodness… before I really got into stitching groups on Yahoo and later Facebook, I like many others was a one piece at a time stitcher. Now I think I am a serial starter (don’t you just love starting a new piece, it is exciting!) who wishes I was disciplined enough to follow every rotation I put in place for myself. Instead I just stitch what I want to when I feel like it. I LOVE geometric and mandala designs, it is just something about the way they are laid out that attracts me. I love Northern Expressions Needlework and Ink Circles for those designs. I also love stitching bunnies (I collect them) and simple holiday designs. However… I am not opposed to stitching most designs put in front of me! That is a hard choice because I love so many of them but I think it is between the Spirit of the Eagle and Walk Softly. I stitched these for my Father and they were my first pieces with beads. That would have to be Bunny Collector. It was my first and LAST attempt at stitching “over 2”. I just can’t get the hang of it for some reason. I finally gave up on this piece, cut off the extra fabric around it and threw the stitching away! I may attempt to do it over 1 someday in the future. I used to crochet but my hands no longer like that craft. I also like to sew but the machine still scares me a bit. I would love to learn to quilt and it is on my list of things to do so the machine and I better come to an agreement soon. Most of all though I would LOVE to learn how to finish my pieces off into “something” so they can be displayed. LOL, I have what many call “The Box of Shame” where most of my finished pieces go to rest while I contemplate what to do with them. The easiest way of course is to frame them but I have even been slacking on that lately. 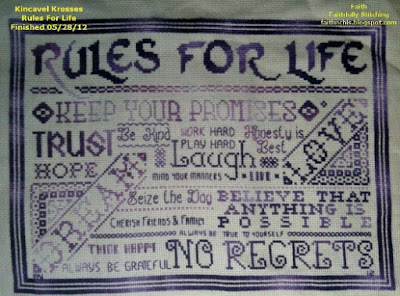 I also like quotes that serve as reminders for everyday living and encouragement so I think that may be Rules of Life which I stitched in my favorite color…purple! I can’t think of any secrets off the top of my head. I am very good at procrastinating and tend to let things pile up which is why I have lots of WIPs and stash! I also love assembling jigsaw puzzles and that obsession has taken over when I can’t sleep at night. 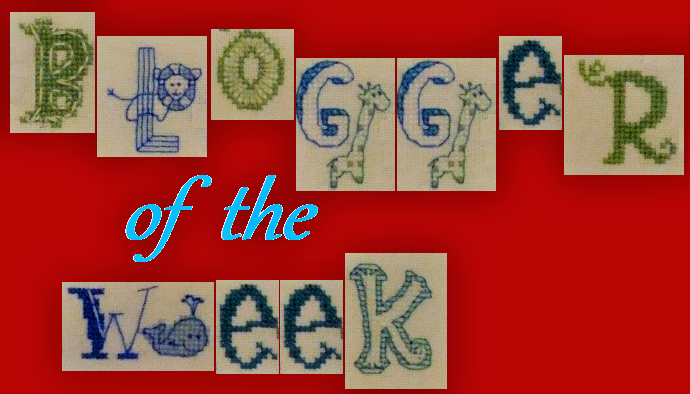 Just want to say a big THANK YOU to Jo for creating this blog so we can get to know new stitchers and learn about others that we have been following for a while. Thanks to all who took the time to read about me! Lovely to meet you Faith,I enjoyed reading your story. The Spirit of the Eagle is gorgeous. Pleasure to meet you, Faith. 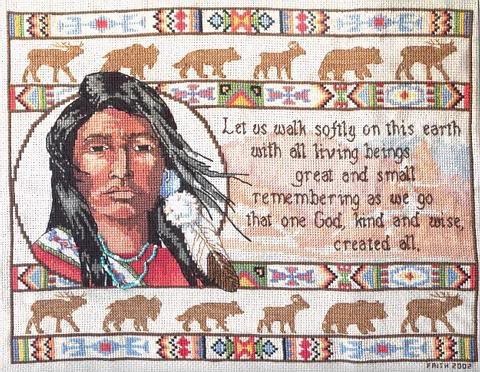 I love your "Walk Softly" piece. Great answers. Thanks for sharing Faith. 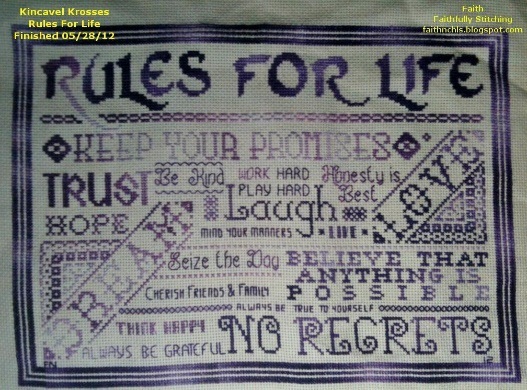 I have the Rules of Life as a WIP and now I've seen two other people that have done it. I guess it's a sign I need to pick mine back up. Well done Faith! Love your finished stitching! Oh your two pieces which you state you are most proud of are wonderful. Thanks for sharing. Hello to you from Sunday City Arizona. Lovely stitching. It was fun reading all your answers, Faith. And wow, these pieces you show here are just adorable. But sorry for your Bunny Collector piece. Maybe one day you can stitch it again on a fabric that you love stitching on. 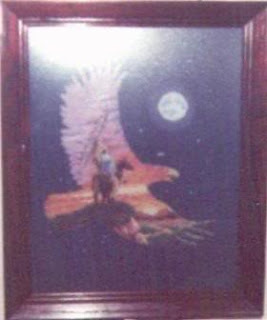 I stitched Spirit of the Eagle for my son. It was fun to learn more about you Faith. Nice meeting you!Love your eagle and Indian!AriadnefromGreece! Hi Faith, nice to meet you! I, too, am a bit scared of my sewing machine, but I'm working on overcoming that fear. I love your Rules for Life! Since you are a No Reply Blogger I thought I would come here to say thank you Leonore for stopping by and commenting. I am trying to overcome that fear by sewing simple things.